Cayenne is the capital and largest city in French Guiana. 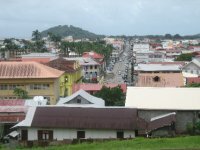 The city is located on the northeastern coastline and has about 100,000 inhabitants living in the total urban area of Cayenne. Since 1664 when the French established a settlement here, Cayenne has been inhabited permanently. It is a very ethnically diverse city with people like Europeans, Haitians, Brazilians and Creole people and combined with the French influence is rather unique in South America. Although it may not be the highlight of a visit to the country, the capital at least deserves a day or so to experience the closest thing resembling a city in French Guiana, and there are several good hotels and points of interest to fill a day. Place des Palmistes - A park with high palm trees, lively in the nighttime. Cayenne is hot and humid all year round, with temperatures rarely dropping below 20 °C at night and hovering around 30 °C or more during the day. The rainy season lasts from January to June. Obviously the drier (but even warmer) season of July to early December is the best season to visit. Cayenne-Rochambeau Airport (CAY) receives all international arrivals and departures. Air France has flights from Cayenne to Paris, Paramaribo, Miami, Haiti, Guadeloupe and Martinique. Air Caraibes flies to Santo Domingo and a few destinations mentioned above, while TAF Linhas Aereas has flights to several Brazilian cities like Belem, Fortaleza and Recife. Air Guyane Express has flights between Cayenne, Maripasoula and Saül. From both neighbouring countries, you will need to cross a river by ferry into French Guiana. From Brazil, you will arrive in Saint-Georges de l'Oyapock from where you can travel by bus to Cayenne with a transfer in Régina. From Suriname you will step off the ferry in Saint-Laurent-du-Maroni from where you can take a bus to Iracoubo and transfer to another going to Cayenne. If you've brought a car, the road is paved from both borders towns to Cayenne. There are not really regular bus connections throughout the country, although a few lines exist to the main towns. Cayenne has a public bus network of five lines. The fare is €1,10. Your other options are obviously car, taxi, foot or bike. The restaurants of Cayenne reflects the ethnic mosaic of the Guyanese society; you will find Creole, French, Chinese, Lebanese and Javanese restaurants here. Except for the carnival weeks, the nightlife isn't as wild as in many other Latin American destinations. There are some nice bars in Cayenne downtown. Nightclubs are generally located in the periphery of the city. Good hotels exist, but they can be relatively expensive. We have a comprehensive list of accommodation in Cayenne searchable right here on Travellerspoint. You can use our map to quickly compare budget, mid-range or top of the range accommodation in Cayenne and areas nearby. This is version 10. Last edited at 3:17 on Aug 2, 17 by sleepBot. 13 articles link to this page.